The front cover has Tamura Yukari. 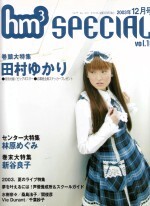 There is no back cover seiyuu in this issue, but the end of magazine special seiyuu is Shintani Ryouko. 1 page event report on Nogawa Sakura 8/2 Shinkiba Studio Coast. 1 page event report on Iizuka Mayumi 8/16 Shibuya AX. 1 page event report on Shiina Hekiru 8/16, 8/17 Ohmiya Sonic City. 1 page event report on Takahashi Naozumi 8/24 Shibuya AX. 1 page event report on Kouda Mariko 9/6 Hibiya Yagai Ongakudou. 1 page event report on Pastel 9/14 Tokyo Melpark Hall. The Pastel members are Shimizu Ai, Koyama Kimiko, Konno Hiromi, Katou Nanae, Shiraishi Ryouko, Hieida Mai, Masuyama Renon. This event was the "Starchild Hour Horebore public recording", with Kanda Akemi, Nonaka Ai, and Shiraishi Ryouko as the emcees. There are tiny pictures of them. 1 page event report on Inoue Kikuko 9/23 Asakusa Koukaidou. 4 pages on Mizuki Nana. Nana at the Hanshin Tigers baseball game. 3 pages on Kuwashima Houko. 3 pages on Seki Toshihiko. 2 pages on Vie Durant (Takagi Motoki and Takahashi Hiroki). 2 pages on PKO (Toriumi Kousuke, Suzuki Chihiro, Saeki Tomo). 2 page interview with Chiba Saeko. 2 page interview with Asano Masumi. 1 page interview with Hiyama Nobuyuki. 1 page interview with Hayami Sho. 2 pages on Weiss kreuz (Seki Tomokazu, Koyasu Takehito, Miki Shinichirou, Yuuki Hiro). 8 pages on Hayashibara Megumi. Many pictures of Megumi at a barbeque. 1 page interview with Ueda Kana. 1 page interview with Pastel. 1 page interview with Kobayashi Sanae. 2 pages on Suzumura Kenichi, Nabatame Hitomi, Orikasa Fumiko. 1 page interview with Matsumoto Rica. 1 page interview with Mieno Hitomi. 1 page interview with Kuribayashi Minami. 6 pages on Shintani Ryouko.